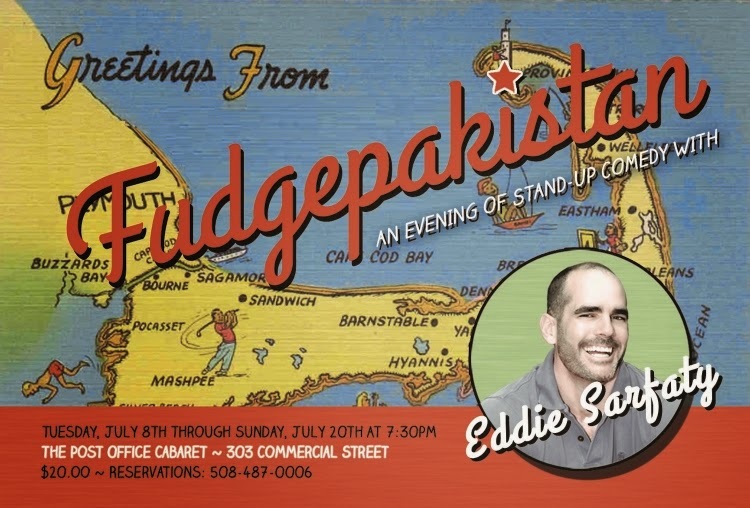 Eddie Sarfaty is a very funny stand-up comic and a writer as well. I first met him several years ago when he was making regular appearances in PTown, sometimes spending most of the summer here. He's been so busy that we haven't seen him much recently, so I was really happy some time ago to find him on Comedy Central's Premium Blend, and I recorded the show so I could watch him again whenever I needed to laugh out loud. Eddie has done numerous TV shows such as The Today Show, has entertained on cruise ships, and appeared at colleges around the country. He's been featured in many comedy festivals, including Montreal's annual comedy event Just For Laughs, a very prestigious celebration which draws audiences totaling about two million people every summer. Eddie is on the faculty of The Theater Lab in Washington, DC, and also at New York University, where he teaches courses in stand-up and in comedy writing. His collection of humorous essays, Mental: Funny in the Head, is now in its third printing. His essays have been published in the anthologies Best Gay Stories 2013, and Love, Christopher Street, among others. The Huffington Post called him "a comedic genius" when they published a bit of his work. Click this link to see Eddie's brilliant riff on gay marriage. P. O. Cabaret box office, open from 2 PM till 10 PM, or call them at 508 487-0006. Have dinner at the Post Office Café before the show and get priority seating in the first few rows of the cabaret, right upstairs. Just mention it to your server. It's great to have Eddie back in town. Be sure and catch him, while you can. it is something new, unique and different.. great article, its really very nice and i have learned very new things from this site i have never seen from other site.. Thank for sharing with us..